Would you like to present with impact? Would you like to get remarkable results through leadership? Would you like to get your team to embrace change? If you answered “yes” to any of the questions above, then look no further than Craig Valentine. Craig will make your audience TALL (Think, Act, Laugh, and Learn) as they get the motivation and tools to exceed their goals. Click here to book Craig now! Craig Valentine, MBA, an award-winning speaker and trainer, has traveled the world helping speakers, executives, and salespeople turn their presentations into profits. Known as the Master Storyteller, he is a professional speaker and has spoken in in the United States, Taiwan, Canada, Jamaica, Qatar (Doha), England, Bahamas, Hong Kong, China, Saudi Arabia, Kuwait, Australia, India, Sri Lanka, Indonesia, South Africa, and Japan giving as many as 160 presentations per year. 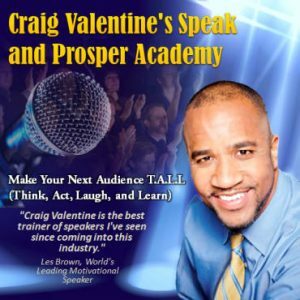 In 1999 Craig won the World Championship of Public Speaking for Toastmasters International and in 2014 he co-authored the Amazon.com #1 Bestselling book, World Class Speaking In Action. … dynamic and inspirational, energizing and entertaining. It was a truly amazing experience to participate in! Wow! Phenomenal! Powerful! These are just a few of the reactions to your amazing session. You are truly the best speaker I have ever heard, and my first day back in my sales territory, I was charged.